Amiens Cathedral, the Cathedral of Our Lady of Amiens (French: Cathédrale Notre-Dame d'Amiens), is by far the most famous building in Amiens. The cathedral was constructed between 1220 and 1247, after a fire destroyed a previous cathedral on the site. The building is constructed in three tiers in the Gothic style, and is the largest in France of its kind. Particularly noteworthy features including the beautiful sculptures and the inlays in The floor. 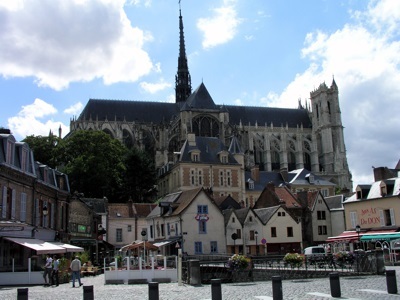 Amiens cathedral has been designated as a UNESCO World Heritage Site.